the latest add-on packs for Pic-a-Pix Deluxe, their popular picture puzzle game for Nintendo Switch. Pic-a-Pix Deluxe is the only picross game for Nintendo Switch to include touch screen controls, a four player multiplayer mode and regular monthly content updates. August will see the release of five new packs of puzzles as low-price downloadable content on the Nintendo eShop. For casual players, Small Puzzles 8 includes 45 puzzles using only 10x10 and 15x15 grids. For those who can’t decide - or who just can’t get enough - Mixed Puzzles 8 features another 30 puzzles across all those sizes. 40x30 and 45x35 grid sizes. These brand new puzzles are certainly not for the faint of heart! With 300 puzzles included in the base game and 30 add-on packs already available, Pic-a-Pix Deluxe is the new king of picture puzzle games! In total, there are more than 1,500 puzzles to solve - and more will continue to be added every month! 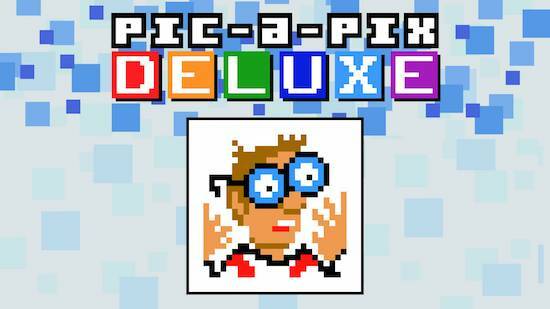 A free downloadable demo of Pic-a-Pix Deluxe is also available on the Nintendo eShop.